The Spotted Whistling Duck is native to Indonesia and Papua New Guinea, it has never been common in captivity and sadly its numbers seem to be declining. They are easily maintained on a diet of wheat and pellets but do also appreciate the addition of a little millet in their wheat and lettuce or spinach leaves placed on the water are greatly enjoyed. Considering their native habitat Spotted are remarkably hardy and while some shelter from the severest weather is recommended many breeders leave their Spotted out all winter and they do seem able to cope. In my view Spotted are easily capable of withstanding many degrees of frost overnight but if temperatures fall below freezing by day and night then some additional protection is sensible. I would recommend the erection of a very simple shelter prior to the onset of winter so that the birds get accustomed to it and will then use it if the temperatures fall particularly low during the winter. 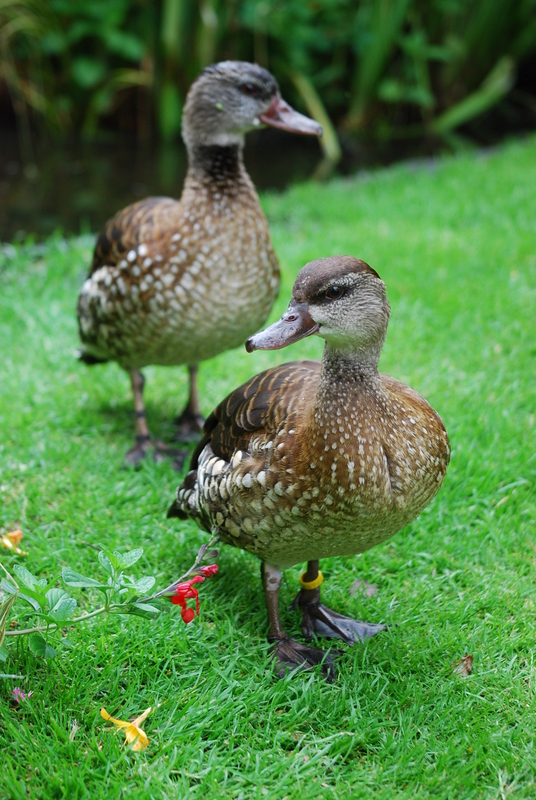 Unlike most species of waterfowl the whistling ducks have not evolved to be able to tuck their feet into their feathers and consequently their feet are susceptible to frost bite in severe weather. While frost bite does not usually prove fatal a severely lame whistling duck is a very sorry sight and clearly this is not something that any responsible owner should let happen if it can be avoided. Another option instead of providing shelter in the waterfowl enclosure is to just move the whistling ducks into a shed or garage if temperatures fall particularly low. Whistling ducks are very tame by nature and moving them inside is usually very simple and they can be kept on straw or wood shavings until the weather improves. If they are kept inside for a period of time care must be taken when putting them back out in the enclosure because they may lose their waterproofing. This is only temporary and is quickly regained but care needs to be taken if it is cold so that they do not get pneumonia when they are initially put out and get wet. When paired Spotted are very devoted and it is unusual to see them apart and they will regularly be seen mutually preening. They spend a lot of time on land and really enjoy standing on tree stumps, clumps of your favourite bulbs as they emerge in the Spring and other rather comical antics. During the breeding season they become very vocal and they will spend significant amounts of time investigating all manner of nest boxes. Once they have chosen a box they will spend a great deal of time in the box or standing on it. Spotted can breed when they are about nine months old but it is common for them to not breed until the second year. As with most whistling ducks they tend to produce large clutches of rounded chalky white eggs, nine to twelve being usual. Incubation takes about 30 days. During the breeding season Spotted can become agressive towards other waterfowl. As with all whistling ducks the ducklings are delightful and very tame and if reared artificially will thrive on a basic starter crumb diet. From day one if you whistle to the ducklings they will all stand upright and whistle back. They can normally be expected to grow well and are relatively trouble free but in recent years a number of breeders across Europe have been experiencing difficulties with rearing Spotted. They appear to thrive for about three days and then significant losses occur. As yet the reasons for this have not been identified but it is concerning and unless the cause can be identified and remedied the Spotted will continue to decline and it would be a very sad day if the Spotted was lost to aviculture. Spotted may not be highly coloured but they are great characters and a joy to maintain. Pair of Spotted Whistling Duck, female in front.